Solar chimneys are yet another way to capture energy from the sun. The feasibility of this technology was demonstrated in a test plant that ran for a few years in the early 80’s but it has been largely ignored since. I'll explain what these chimneys are and how they work in a moment but first I want to mention some nomenclature. 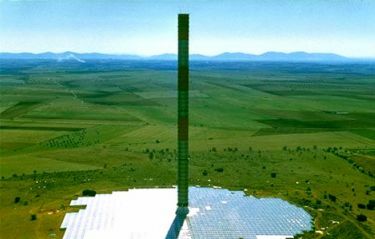 Solar chimney is the original name for this type of energy device, but some people now call it a solar tower predominantly because they what to avoid association with the word “chimney” that might imply that there is some kind of emission from a solar chimney. The only thing that comes out of a solar chimney is hot air. I’ll continue to use the “C-word” to refer to this technology, which is quite different from the I’ve previously described on the Solar Tower page. Two principles are used to produce energy with this approach: the greenhouse effect and the fact that hot air rises. The greenhouse effect is the fact that sunlight passes through glass, warms the interior changing its energy to heat that is then trapped by the glazing. You’re familiar with this effect if you’ve ever gotten in a car on a sunny day. The interior is much warmer than the air temperature because of trapped heat. The other principle is that hot air rises. The layout of a solar chimney power plant is a large green house with a chimney in the central part of it. The chimney is the only way for hot air to exit the structure. The higher the chimney is, the cooler the air is at the top and the more powerful the thermal current will be. The rising hot air creates a wind in the chimney. Turbines transform the wind energy to electricity. The process isn’t very efficient, but you have to admire its simplicity and its cleanliness. It only uses air heated by the sun. As I mentioned, the demonstration project in Spain showed that such structures could generate significant electric power. The plant was built in 1982, produced electricity for a few years and was damaged by a storm in 1989. The facility was never intended for long-term production and was made of very lightweight material. For example the center tower was made of very thin steel and was supported by guy wires that were not corrosion resistant. After it was damaged in a storm, it was never repaired and interest in this approach waned with low fossil fuel prices. With today’s environment concerns and rising fuel prices. It is again being explored. The nature of these plants places some restrictions on where these power plants might be practical. Obviously, it needs to be somewhere with a lot of sunlight. The area of the greenhouse/heat collection part needs to be quite large, so it needs to be located where large tracts of land is available and reasonably priced. Many desert regions meet those criteria, but deserts aren’t where people live. That means transmission lines might not be readily available and the necessary infrastructure will need to be built. Clearly that adds significantly to the expense. People wonder if such a power plant is the best use for the large areas of land required. Some environmentalists wonder if the hot air released by the chimney might be sufficient to warm the atmosphere directly. If that were the case, the plant might contribute to global warming even without carbon dioxide emissions. These concerns are very real and companies interested in exploring this approach consider them carefully. There are proposals for commercial projects in several counties, but as far as I know, no one has broken ground on such a plant yet. Whatever it's eventual fate, this is a workable technology of elegant simplicity. Perhaps surprisingly, the same principles can also be used to cool houses in warm climates. When I write a page about that, I'll link to it here.